Despite stereotypes that paint millennials as "all technology, all the time," young people may still prefer curling up with a paper book over their e-reader—even more so than their older counterparts—according to a new study from the University of Arizona that explores consumers' psychological perceptions of e-book ownership. 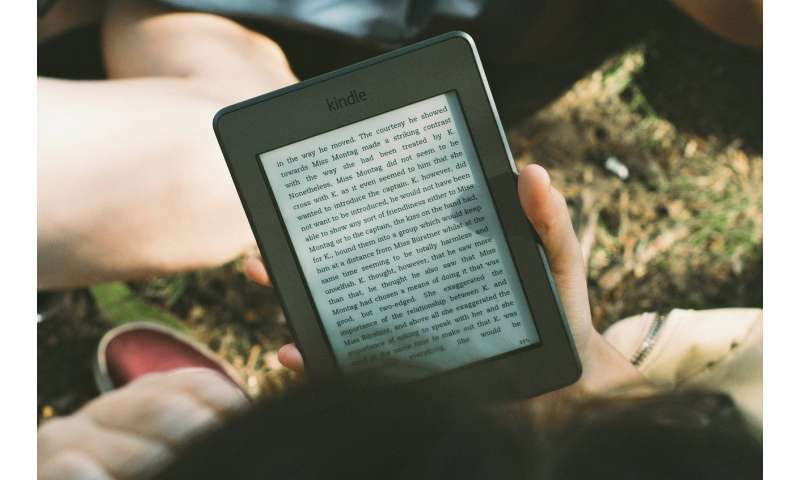 The study also found that adult consumers across all age groups perceive ownership of e-books very differently than ownership of physical books, and this could have important implications for those in the business of selling digital texts. "We looked at what's called psychological ownership, which is not necessarily tied to legal possession or legal rights, but is more tied to perceptions of 'what is mine,'" said lead study author Sabrina Helm, a UA associate professor who researches consumer perceptions and behaviors. Peoples' sense of psychological ownership is affected by three primary factors: whether they feel like they have control over the object they own, whether they use the object to define who they are, and whether the object helps give them a sense of belonging in society, said Helm, who teaches in the UA's John and Doris Norton School of Family and Consumer Sciences in the College of Agriculture and Life Sciences. "Psychological ownership is important in people's perception of how they value certain products or services or objects," she said. "In the context of digital products, we thought it would be appropriate to look at how people take ownership of something that's not really there—it's just a file on your computer or device or in the Cloud; it's more of a concept than an actual thing." For the study, which is published in the journal Electronic Markets, Helm and her colleagues convened four focus groups in different age ranges: one group of Baby Boomers; one group of members of Generation X; and two groups of millennials. The millennial groups were split into current college students and older millennials. The researchers moderated discussions with the groups about their feelings surrounding ownership of physical books versus e-books. —Participants across all age groups reported feeling a constricted sense of ownership of digital books versus physical books, based on the fact that they don't have full control over the products. For example, they expressed frustration that they often could not copy a digital file to multiple devices. —Along similar lines, many study participants lamented restrictions on sharing e-books with friends, or gifting or selling the books, saying this made e-books feel less valuable as possessions than physical books. —Participants described being more emotionally attached to physical books, and said they use physical books to establish a sense of self and belonging. Participants across age groups frequently spoke about their nostalgia for certain childhood books. They also talked about experiencing physical books through multiple senses—describing, for example, the sound, smell and tactile experience of opening a new book, and the ability to highlight or write notes on paper pages. Participants also said they use their physical book collections to express their identity to others who might be perusing their shelves. E-books did not have these associations. —Minimalists expressed a preference for digital books because they take up less physical space. —Many participants said the e-book experience feels more like renting than buying. —While almost everyone expressed strong attachment to physical books, and no one embraced a fully digital reading experience, older consumers, contrary to what one might expect, saw more advantages than younger consumers to reading with an e-reader. They referenced physical benefits that might not be as relevant to younger consumers, like the lightweight nature of e-readers and the ability to zoom in on text. Understanding differences in how people relate to digital versus physical products is important, especially as digital products become more ubiquitous in various domains of life, Helm said. "One of the conclusions of our research was that digital books and physical books are entirely different products," she said. "E-books feel like more of a service experience; overall, they seem to offer a more functional or utilitarian experience. You have much more richness if you deal with a physical book, where all your senses are involved." "Physical books are very special products, and we know that physical books have a lot of meaning for a lot of people," Helm continued, noting that books are one of the earliest objects with which children interact. "Digital reading is still fairly new, digital books are still a fairly new product category, and thinking about ownership in the context of these kinds of products is new for most people." They should focus on making the e-reading experience more closely emulate the experience of reading a physical book, which might require making physical changes to e-readers that make it easier to do things like scribble notes in the margins, for example. They should further distance e-books from physical books and focus on establishing e-books as a unique form of entertainment—more of a service-based experience that includes features you can't get from a physical book, like an integrated soundscape, for example. "A lot of participants pointed out that they see digital books as too expensive for what they deliver, because they don't offer the same richness as a physical book; you read them and nothing is left," Helm said. "If we position digital reading in a different way—as an independent service experience—consumers might be willing to pay a higher price if there's an obvious added value. If it's different from a physical book, they won't compare it to the physical book anymore, because it's an entirely different form of entertainment." Helm emphasized that both physical and digital books have their place. "There are just really different values or benefits that we get out of them," she said. Spot the Dog stopping kids from spotting new words?